I must say I was very excited to be chosen to do this review , as I had often admired Mrs. Flanders website. Her website is educational and informative for the godly christian woman seeking to be a blessing to her family. She truly exemplifies what it means to be a crown to her husband, a godly wife and mother. In the days we live in I find her life to be refreshing and encouraging to me and I am sure it is to many others as well. This devotional is a wonderful testimony to her desire to share godly womanhood with younger women and in so doing bring honor to the Lord Jesus Christ ! It is not often that you find a woman who will boldly stand for what is biblical and right in today’s society. I am happy and blessed to call Jennifer, not only my friend but my sister in the Lord ! My First Impression is what a lovely gift for a Bride to be ! wonderful gift and a personal addition to your families heritage ! to come in the family !!! Very Nice !!! shared between a husband and wife as they grow together in Grace ! gift or a gift for a young ladies hope chest on a special birthday perhaps. What a blessing to future generations of women in godly families ! As you can see these pages make for a great devotional, a study and one could easily color in the pictures to make them a work of art ! honest and unbiased review. I applied for this review through BookCrash. You may find this book here or on the following websites. This entry was posted in Book Reviews, Jennifer Flanders, Reviews, Women Professing Godliness and tagged Bridal Shower, Bride to Be, Courtship, devotional, Hope Chest, Journal, Marriage, Womanhood on May 15, 2016 by Linda Marie Finn. Some of you might wonder ” Why the name change ? ” other’s of you know what it means. Women Professing Godliness is part of a verse in the New Testament of the Bible. If you read my about page you will see what it means to me. In my soul searching the last month or so I have come to see that getting back to the basics means I want to be right where the Lord wants me to be. Part of that soul searching lead me to spending many days, weeks offline for the most part and reassesing what really needed to be changed in my life to be in that perfect will of God. To be the woman God wants me to be and to walk in holiness before him and others. To not just profess godliness but to live and display it for all to see and witness in my life. In one of my recent posts Hello is Anyone Home ? I was Home, but not really at Home. I was doing so much , striving to make everything work and yet life was so stressful for me that I was literally getting sick. What good was I to God, My Husband or my children if I was sick. So I prayed a lot during the time I was offline and was really seeking where things had gotten so messed up and so stressful. When we leave doing things God’s way, things get very stressful. God has an order for us to follow and he has instructions we are to follow in His Word the Bible. No matter what the cost is personally, I needed to do this and have assurance in my heart knowing God would work everything out. I needed to do as he said and trust the rest to Him. I spoke of Trust in my sharing on God’s Provision. Do we really trust Him ? I know we say we do, but down deep we tend to walk things out in the flesh and say were trusting Him, but in reality we aren’t. Yes it might mean things will be harder, but in the long run it will mean getting a blessing. God is faithful to us, even when we are not so faithful to Him. When we profess to be godly, we need to display Him and his rightiousness. Otherwise we are walking out a lie and a falsehood. So for me being a Keeper at Home, Wife, Mother, Grandmother, Daughter, Sister and Friend, I wanted to be what I am suppose to be and do it according to God’s standards, not anyone elses. I knew that if I did this I would be blessed of God and I knew that my husband would be happy with me. That is important to me. To know that God is happy with me and that my husband is also happy. But I also needed to be happy with myself. This leads to a happier home. I want my profession to match my life. I want others to see Jesus in me. I want them to bear witness that what I say is indeed the way I live. So for Today this is why I changed the name of my website and this is the way I long to live. where the Lord is leading me back to and what is happening in my life. I know that some of these changes may mean loosing those who follow here, but thats ok. I am following God, not society’s ideas of who I should be. 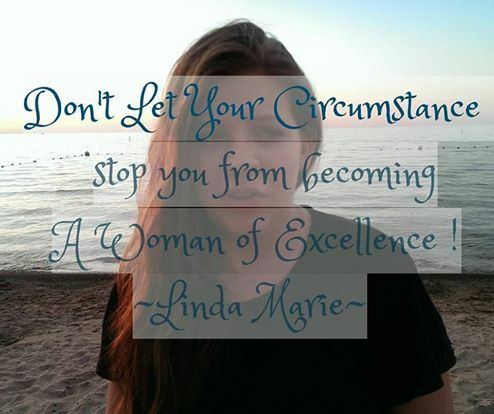 This entry was posted in Women Professing Godliness on September 30, 2014 by Linda Marie Finn. Sometimes things in life just seem to be way too hard and out of our control. Things just don’t seem to go right and we are finding it hard to make money on the side to keep things going smoothly. Maybe you/spouse is on disability for some reason and unable to work full time or part time. Or maybe your a one income family, where Mom stays home with the kids or visa versa if your husbands out of work and maybe you homeschool your kids, so your at home. God has it covered ! You don’t know where your next bit of food will come from.. So you can feed your family ! God does know and whatever he has brought you to, He will bring you through it. I can so relate… Married but sorta living the solo parent life right now. My DH is disabled and we live on a fixed income of SSD. Things do get tight at times and we have to rely on God to provide for us what we can’t do ourselves. That requires faith and lots of it ! So your down to your last can of beans and a bag of rice ? What do you do ? You pray and you eat what you have. You visit family or friends for a meal. You call a church for help. You ask for help ! If there is one thing I have learned over the years , its that your pride can’t stand in the way of you feeding your family. Everyone has hard times in life. I know that God doesn’t expect anyone to go it alone. That is why we as christians need to help each other, we are family. Sometimes more so they real blood family. And all that believed were together , and had all things common; And sold their possessions and goods and parted them to all men, as every man had need. And they , continuing daily with one accord in the temple, and breaking bread from house to house, did eat their meat with gladness and singleness of heart, Praising God and having favour with all the people. And the Lord added to the church daily such as should be saved. So it seems that they took care of the needs of their brethren /sisters and no one went without. They went to temple to learn and then ate at each others houses. And notice they were happy, praising God and everyone was getting along. And the Lord added to their number daily those that should be saved. ( notice it doesn’t’ say those that would be saved… ) But you do have a choice to make concerning your salvation. The closest thing to this that I have experienced was in TN ( although I will say that some folks were strange) We met together whenever we were visiting house to house, several times a week and this was to talk of the Lord and to eat a meal or two. We had the greatest times. We talked about the Lord and shared life, no matter how hard it got and you knew that no one (well almost no one) would let you starve or go without. Here in NY, I was raised to help anyone who needed help. That is just the way my parents raised us to be. Yes I grew up in a christian home as dysfunctional as it was, we were family. God provides for you through your brothers and sisters in Christ. They may bring you food, clothing, or even work to do that provides you money to get what you need. They may even provide a place for you to stay till you get on your feet and can do it on your own. It may even come when you didn’t share what your needs were… But God knows your needs. It may come because you shared your needs… and there is nothing wrong with that. To this I have to say that you missed the answer. Sometimes He says WAIT and TRUST ME ! How Much Do You Trust Him ? This entry was posted in Women Professing Godliness and tagged Faith, God's Provision, Help, Provision, Real Christianity, Trust on September 25, 2014 by Linda Marie Finn.